The Buffel was the first efficient mine protected armoured personnel carrier fielded by the South African Army. The vehicle is basically a Unimog chassis fitted with a mine protected troop “bathtub” and a separate mine protected driver cabin. The “bathtub” had hinged sides that drop down to allow troops to quickly debus from the vehicle. In combat however the sides were rarely dropped as it consumed time and as the sides had a tendency to swing back injuring the troops. It was therefore more common for the troops to jump over the top, an action which required some skill due to the height of the vehicle. The “bathtub” also allows the troops to fight from the cab to some extend. By using the basic Unimog chassis the vehicle is endowed with excellent cross country capability, earning it the nickname of “Grens Donkie” or Border Mule, although the additional weight of the cab has to some degree reduced this. 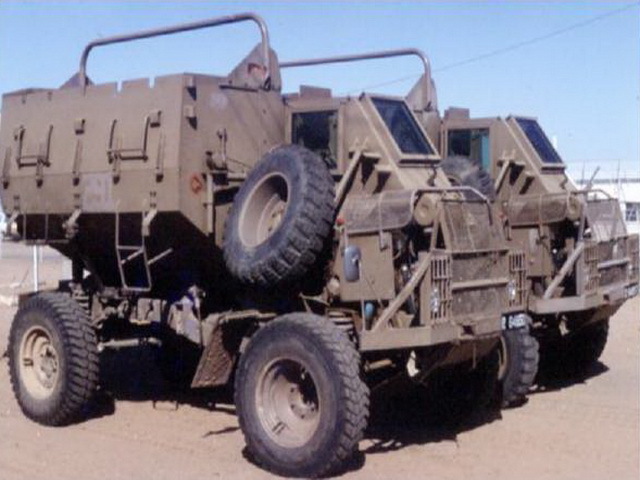 Another feature shared with many South African armoured vehicles is the provision of a water tank for operations in the semi arid areas of Namibia and South Africa. The vehicle also has additional fuel tanks giving it very long range.